Seems like it was few days ago (25 Nov) when the Amnesty International highlighted human rights in Iran have remained a low priority despite earlier promises made during the presidential campaign, furthermore Iran’s prisons remain full of political prisoners and prisoners of conscience, many of whom suffer from lack of adequate medical care. The Islamic Regime of Iran quickly gallops his horse in the international arena, and nobody can stop him. 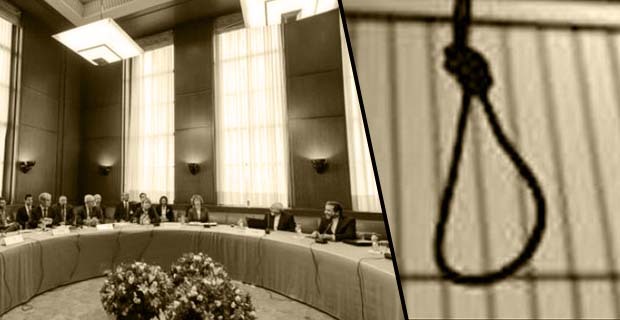 According to the report of HRANA News Agency, the anti-human regime of Iran hanged 11 prisoners 11 including 10 men and a woman in a mass execution in Ghezel-Hesar prison, Karaj, west of Tehran on Monday 25 Nov. After these executions all prisoners of this ward went on hunger strike. “We did not get the food which is given to us by the prison and gave the food which we had bought from the prison shop to the guard room. There are 3000 death row prisoners in this ward. We want our cases to be retreated and the death penalties to be repealed.” that was one of the prisoner’s talks. A day before this mass hanging, more than 1000 prisoners went on hunger strike protesting this inhumane sentence. Families of the victims had protested outside the Ghezel-Hesar prison prior to the execution asking the annulment of the sentences, but according to the other prisoners, Amoozadeh, of the prison wardens told the condemned prisoners that ‘you will all be hanged after the Geneva talks with the P5+1, stated the People Mojahedin Organization of Iran. Following the execution wave in the past months in Iran, families of death row prisoners gathered on Tuesday (26 Nov) outside the Iranian Parliament in a peaceful protest against the death penalty, various human rights agencies reported. The protesters who were mainly women were carrying placards where it was written “Why Death Penalty? Firat News Agency reported from Tehran. Based on ROJ News Agency, to protest against the poor conditions in Prisons of Minab, Bandar Abbas and Bandar Lenge also repeated violation of prisoners rights, seven Kurdish political inmates namely “Ali Moradi, Afshin Sohrabzadeh, Mohammad Hossein Rezaei, Darwish Zandi, Hassan Javani and Karim Musazadeh” in addition “Arzhang Davudi” political prisoner are on hunger strike 20 days ago. On Monday (25 Nov) two institutions “Kurdistan Human Rights Association KMMK and Campaign in Defense of Civil & Political Prisoners” issued a statement expressing deep concern about the health status of prisoners on hunger strike added, the prison officials so far not only respond to the legitimate demands of strikers but even have been transferred some of them to solitary confinement. It is worth mentioning that the types of psychological-mental stresses, lack of attention to the physical conditions of inmates by prison doctors-linked the regime also discrimination and torture have grown over against civil and political prisoners in Bandar Abbas and Minab Prisons. This unacceptable circumstance has become a daily matter and commonplace, was called “hellish jail” by the prisoners. Coincided with the escalation of violence and breach of Human Rights in the Iran Prisons, on November 21st “Kaveh Veisi, Mokhtar Rahimi, Kaveh Sharifi, Behrouz Shahnazari, Taleb Maleki and Shahram Ahmadi”, the Sunni prisoners who have been sentenced to death on charge of supporting the Salafi groups, are transferred to ward 350 of Evin prison after 15 days hunger strike. HARANA News Agency revealed. This accusation denied many times by the prisoners and they believe they have been sentenced due to their religious beliefs and the hatred of the government against the religious minorities. While media primarily focuses on and interested in the negotiations over nuclear program in Iran as the only issue in Iran, Rouhani and his regime is exterminating political prisoners by executing them, or by depriving them of medical attention. 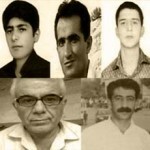 On 26th of October 2013 Hebibulla Gulperipur, a well-known political activist and Reza Ismaili (PJAK members) also 16 other political prisoners were executed in Iran. Again, on 4th of November 2013 Sherko Mearefi, another Kurdish political prisoners, was executed in west of Iran. 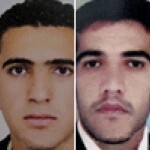 Zanyar and Loghman Moradi, two well-known political prisoners are in an imminent danger of being executed anytime soon. Moreover, the Islamic regime is massacring hundreds of political prisoners by the way of “silent death” to prevent the news and the statistic being reported as executions in the Islamic regime, asked Campaign to Free Political Prisoners in Iran (CFPPI). According to Ahmed Shaheed the Special Rapporteur for HR in Iran, Of particular alarm are reports that some 724 executions took place between January 2012 and June 2013; of those, 202 were reportedly carried out in the first half of 2013, 135 of which were officially announced by the Government.